So what should libertarians, Reagan conservatives, and other advocates of smaller government think of the “cromnibus” spending bill? The answer depends on your benchmark. If you dislike insider deals, pork-barrel spending, and you think the federal government should be limited to the enumerated powers put in the Constitution by our Founding Fathers, then the cromnibus is an abomination. But if you look at where we are right now and you think victory is achieved whenever we can shrink the burden of government spending and limit Washington’s power over the nation, then the cromnibus is a victory. Let’s start by looking at the optimistic case, which is ably summarized in what Peter Roff wrote for U.S. News and World Report. 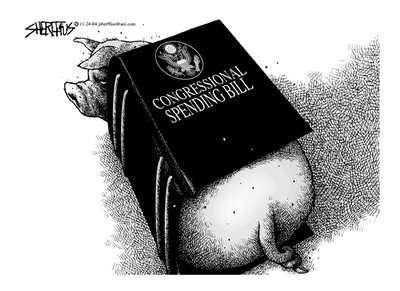 …the “cromnibus” legislative vehicle to fund most of the federal government through September 30, 2015 is a major victory for the conservatives…the combined continuing resolution and omnibus funding bill [hence the term “cromnibus”] maintains the Ryan-Murray spending caps of $521 billion for defense and $492 billion for non-defense spending. …It blocks funding of the risk corridors that, under the Affordable Care Act, could lead to a government bailout of the insurance companies…while cutting the funds for the Independent Payment Advisory Board (which is the body that would be recommending any rationing of health care) by $10 million. The bill also cuts funding for the U.S. Environmental Protection Agency by $60 million, which is the fifth consecutive year the agency’s budget has been cut and may finally convince the bureaucrats who run the place they cannot go beyond what they are legally authorized to do without congressional approval. And it hits the Internal Revenue Service particularly hard, cutting its allocation of federal dollars by $345.6 million, prohibiting it from targeting organizations because of the way they chose to exercise their First Amendment rights or on an ideological basis… There’s more, but the general drift of the thing is toward smaller, leaner, more transparent, more honest government than has been the case over the last six years. There’s a lot to like in what Peter wrote. I like the spending caps, even if they’re too high. And I unambiguously like imposing some fiscal restraint on the EPA and IRS. Cromnibus was a fruit basket of special-interest provisions that K Street had been requesting for years. If you read to the very end of the bill — page 1,602 of 1,603 — you would find a section titled “Modification of Treatment of Certain Health Organizations.” This provision would provide protection from an Obamacare provision for exactly one entity: Blue Cross Blue Shield. …Or look at page 1,153, which reauthorizes a federal agency whose job is to subsidize American-owned foreign businesses and the banks that finance them. The Overseas Private Investment Corporation extends taxpayer-backed loans and guarantees to U.S. companies when they set up shop overseas. OPIC is naked corporate welfare. …Bills like Cromnibus, crafted in darkness and presented as must-pass legislation, allow the special interests to get what they want. A free and open debate on these issues is what the country needs. These examples are just the tip of the iceberg. Tim is completely correct about the cromnibus being business-as-usual sleaze and corruption. There’s no question that a bunch of lobbyists were big winners. So who’s right about the cromnibus, Peter or Tim? I hate to sound like a mealy-mouth, finger-in-the-wind politician, but they’re both correct. The cromnibus fight turned out like the appropriations fight of 2011, the debt limit fight of 2011, and the fiscal cliff fight of 2012, all of which had some disappointing features and some encouraging features. In other words, we’re dealing with the reality of divided government. Even next year, when Harry Reid no longer controls the Senate, it will be very difficult to win big victories. Let’s say that Republicans decide to pursue aggressive policies such as fundamental tax reform and genuine entitlement reform. I’ll definitely applaud, but – at the risk of stating the obvious – does anybody think such legislation would attract enough support to overcome a veto from the White House? The bottom line is that the cromnibus was a typical kiss-your-sister compromise and people, after weighing the pros and cons, probably like or dislike the outcome depending on the issues that matter most to them. If you first and foremost don’t like lobbyist deals, then you are going to be unhappy. Likewise, you won’t be happy if your main goal is stopping the President’s executive amnesty. But if your big issue areas are reining in the EPA or IRS, then you’ll presumably be – on net – cheerful. Similarly, if you care about preserving spending caps, you’ll view cromnibus as a win. My view, for what it’s worth, is that Republicans did a decent job, but could have achieved much more if they were willing to hold firm on certain issues, even if it meant Obama and/or Reid decided to shut down the government. But for reasons I still don’t understand, GOP bigwigs think they lost the shutdown fights of 1995 and 2013. And so long as they hold to that view, they’ll be limited in what they can achieve. P.S. 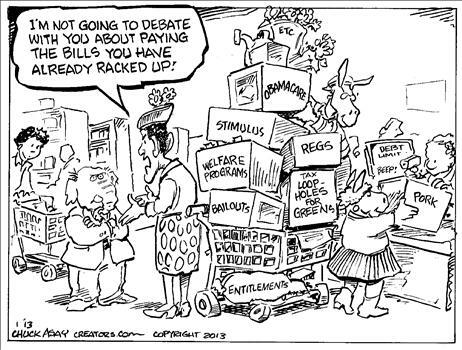 Since I mentioned that the cromnibus contains some long-overdue cuts to the IRS budget, here’s an amusing cartoon from Jerry Holbert that reminds us why they don’t deserve more of our money. 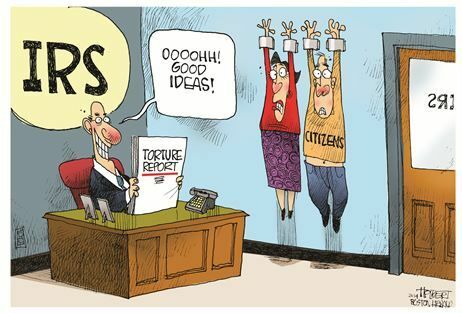 Definitely something to add to our collection of IRS humor.